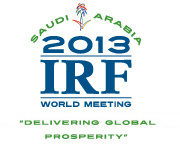 I am very pleased to share with you this year's second edition of the IRF Newsletter. These are busy times at the Secretariat and we are pleased to present you with our activities. IRF ran a first successful IRF Webinar on Data Collection & Statistical Practices for Road Safety Policies, on 7 March 2013. Based on the success we will be planning more online seminars to present and address topical subjects within a highly interactive web-environment. Read more about the webinar in the Newsletter report below. Not a week away now is our IRF Regional Conference: North-Africa & Mediterranean. The programme is jam-packed with a plenary conference programme, a high level segment, panel debates, three (!) interactive parallel workshops and a gala dinner staging the InARoaD Awards Ceremony. Please have a look at our workshops overview in the Newsletter. Reserve your seat quickly as places are high in demand. More information can be found on www.irfnet.ch. Marrakech will also be the venue for the upcoming IRF General Assembly and Board of Directors meetings on Monday 18 March, as well as formal and informal meetings of IRF Working groups and committees. Next to these activities, IRF keeps up with her advocacy and representational roles by presenting at the UNECE pre-ITC Road and Rail Financing conference as well as representing the IRF membership at the second meeting of the EU ITS Advisory Group in February in Brussels. You will find the reports below. I hope to welcome you all in great numbers to Marrakech. The IRF Geneva's inaugural Webinar on Data Collection & Statistical Practices to Support Road Safety Policies took place last Thursday 7 March 2013. Participants from all over the world attended this successful Webinar. 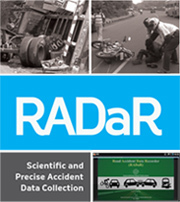 The main subjects covered in the Webinar included: the data collection and statistics of the World Road Statistics (historic series from 1963 to 2010); the data collection & tool for police crash traffic (RADaR); and the recent developments on road safety data app(lication) on smart phones for all stakeholders. Ahead of the 75th jubilee session of its Inland Transport Committee, the United Nations Economic Commission on Europe (UNECE) organized a Road and Rail Financing conference on Monday 25 February, on the occasion of the launch of the UNECE study on Europe-Asia Transport Linkages Phase II. The conference comprised a mix of plenary and parallel break away sessions, addressing key issues in financing road and rail infrastructure, public-private partnerships, the role of technology and more specifically Intelligent Transport Systems (ITS). The United Nations Road Safety Collaboration (UNRSC) - of which IRF is an active member - will be meeting this week in Geneva to enhance amongst others preparation for the second UN Global Road Safety Week. The week 6-12 May 2013 is dedicated this year to pedestrian safety. Requested by the UN General Assembly, the Week will draw attention to the urgent need to better protect pedestrians worldwide, generate action on the measures needed to do so, and contribute to achieving the goal of the Decade of Action for Road Safety 2011-2020 to save 5 million lives. On 26 February the EU ITS Advisory Group convened for its second meeting in the Berlaymont Building in Brussels. Three themes were addressed on the meeting's agenda: 1. The ongoing efforts into developing specification supplementing the ITS Directive; and 2. Deployment strategies for Cooperative Systems; and 3 Funding of ITS Deployment: EU instruments and strategies. 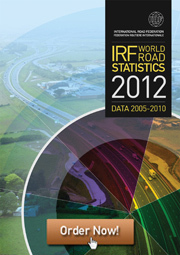 This year 2013, our IRF's flagship product World Road Statistics (WRS) is celebrating the 50th Anniversary and planning to publish a commemorative edition. This publication is the main statistical reference for governments, international organizations, public and private companies, NGOs, investment banks, research and academia and the media.